FCCLA members Jenny Varela (left) and Gracie Arm presenting their STAR Event. This year’s FCCLA state theme of “Land of 10,000 Dreams” encourages students to row their boat to success, catch a multitude of leaders, and dive into career paths. 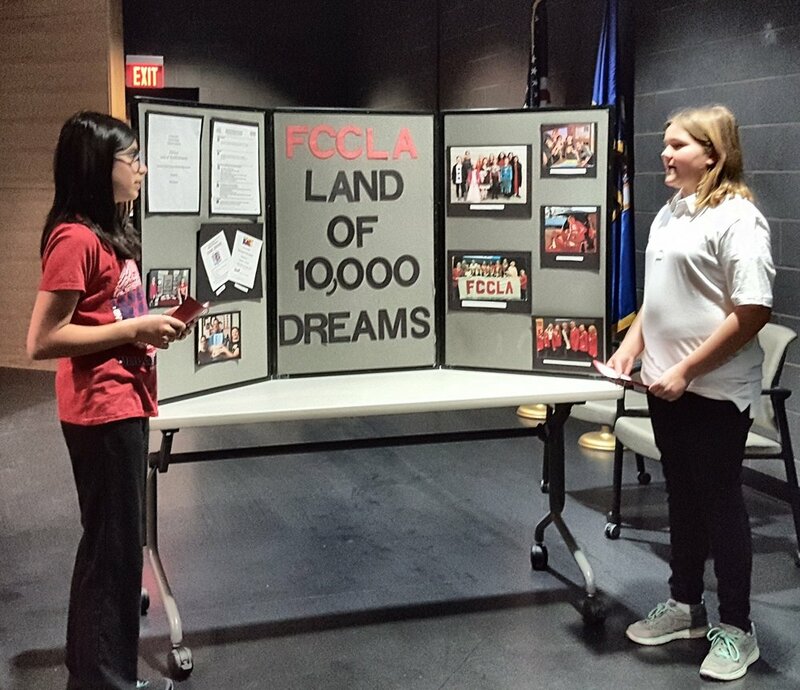 WDC’s FCCLA chapter is celebrating National FCCLA Week, Feb. 11-15. In October, the WDC chapter members coordinated a “We Scare Hunger” project that collected 833 pounds of food for the Wadena Food Shelf. Members also help pack weekend bags for students to take home. WDC chapter officers (from left): Mikayla Varela, Angela LeComte, Elliot Doyle, Morgan Grangruth, Madyson Beversluis, and Danielle Dickey. FCCLAers sponsored an annual “Dime Drive” competition between the 5-12 grade students at WDC. Because of the generous students, $667.00 was contributed to the March of Dimes which will go directly to helping the fight against prematurity, birth defects, and infant mortality that impacts babies right here in Minnesota. The 7th-hour Physical Science class was the winner of the Dime Drive and earned the pizza party. Elliot Doyle and Angela LeComte leading the closing ceremony. WDC FCCLA members also planned and carried out a “Super Hero dance party” for students with disabilities from area schools at the Deer Creek Community Center. Donations from local businesses contributed to the success of the fun day for 85 guests. Other individual projects include seatbelt safety for elementary students, fashion construction, nutrition and wellness, and life event planning. Wadena-Deer Creek Family, Career, & Community Leaders of America members have worked hard to prepare for the STAR (Students Taking Action with Recognition) Event competition. Many of their events allowed them to showcase the projects the chapter has been working on this year. Students who competed and have advanced to state competition are: Elliot Doyle, Morgan Grangruth, Casey Bounds, Angela LeComte, Emma Mehl, Danielle Dickey, Jenny Varela, Gracie Arm, Madyson Beversluis, Caleb Cully, Mikayla Varela, and Frannie Bakken. Elliot Doyle is currently serving as the WDC chapter president as well as the Central West Area president. Angela LeComte is serving as a MN FCCLA Peer Educator in addition to being the local chapter secretary. Family, Career, & Community Leaders of America is a dynamic & effective student organization that helps young men and women become leaders and address important personal, family, work and societal issues. The 7th-hour Physical Science class was the winner of WDC FCCLA’s Dime Drive and earned a pizza party.